Gastrotypographicalassemblage – the massive wall art of typographical excellence that once adorned the CBS New York’s cafeteria – was saved from becoming just a memory in photos in video. Photo from CBS Photo archive. The brainchild of famed designer and CBS Creative Director Lou Dorfsman, the 35ft x 8.5ft mural adorned the CBS cafeteria – called the “51/20 Club” – on Sixth Avenue between 52nd and 53rd Streets from 1966 through the mid 90s when it was unceremoniously removed. Many stated that the piece had not been maintained over the years and simply fell into disrepair. The piece was stored in the basement of one of the creators, Nick Fasciano (the designer of the iconic Chicago logo), for two decades. The idea came about during a conversation between Dorfsman, then CBS President Frank Stanton, and interior designer Florence Knoll (yes, of Knoll furniture) in the CBS cafeteria. Knoll wanted to put up some “old maps”. Dorfsman’s idea was based on a gift he created for Stanton featuring a lead type job case and 51/20 Club memorabilia. In an interview, Dorfsman said he saw that the type job case “was a drawer filled with little cubbies that looked very Mondrian-ish,” referring to the landmark designs of Dutch painter/designer Piet Mondrian. He included that if Mondrian had drawn in a space of that size, he might have broken it up the same way. 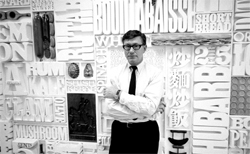 Dorfsman worked with a typographic design dream team – including Fasciano, Herb Lubalin, Tom Carnase – to build the mural. He considered the piece his “gift to the world”. According to a recent press release, Gastrotypographicalassemblage features more than 1,650 individual characters spelling out culinary terminology and expressions, and 65 hand-modeled and painted food-related objects. Thankfully, The Center for Design Study in Atlanta recognized its value as a piece of art history worth saving and worked with Dorfsman and Fasciano to raise funds to restore the piece and find it a permanent home. Dorfsman died in ’08, yet Fasciano carried on, working with others to hand restore each character and object. The restored piece now has a new home at the Culinary Institute of America in their new Marriott Pavilion and Conference Center in Hyde Park, NY., where it will be available for appreciation by foodies and artists alike. The legacy lives on.